We discovered this design gem while visiting my daughter's in-laws in New Hampshire. They have this Capresso electric tea kettle that is pretty just sitting on the counter. But the secret of the design becomes truly apparent once the water begins to boil. Visitors of all ages are drawn to it. We all comment on how a watched pot never boils. I never realized the beauty of watching a pot boil! Not only a lesson in good design but one in science as well. • The tea kettle is available from Amazon. 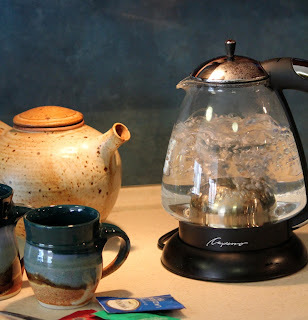 • The teapot is part of my collection of handcrafted pottery. This one was a gift from a former student back in the '70's. We have been looking for an equally beautiful handcrafted teapot for years. The proportions and glaze are perfect. 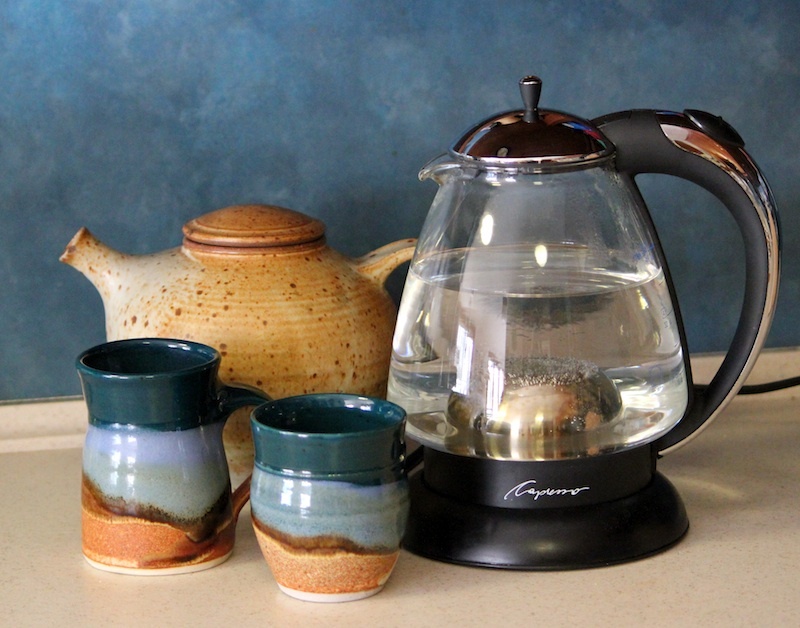 • The mugs are from the Earth and Sky series from Sunset Canyon Pottery. We purchased our first few at New Morning Gallery in Asheville, NC then completed the set (and purchased replacements) online. They come in a variety of shapes and glazes.